By now, you have read page after page of information on migraines. 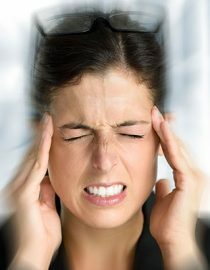 Researchers are continuously finding new information regarding migraines. They are learning more about the condition, which helps discover better preventative and reactive treatments. The links and associations between migraines and other physical health issues are better understood as the data improve. As the research into the physical health aspects of migraines expands, so does the research into the mental health facets. There is already a wealth of information available to process. In reading about migraines and stress, you learned about the direct relationship between level of stress and frequency of migraines. In migraines and depression, you learned about the bidirectional relationship between the two. As migraines worsen, so does depression. As depression worsens, so do migraines. Depression, stress and migraines seem to have a strong association, but there may be a missing piece of the puzzle. That missing piece is bipolar disorder. Every year bipolar disorder impacts millions of people and migraine sufferers are not immune. Recent research is showing that many people with migraines are being misdiagnosed with unipolar depression rather than bipolar disorder. If you have migraines paired with depression and treatment has been unsuccessfully able to manage either, you may actually have migraines and bipolar. Depression – Sometimes called unipolar depression to signify its tendency to stay in one place, depression is a very common mental health disorder. Because it is so commonly known, understood and less stigmatizing, people are more comfortable receiving and accepting this diagnosis. Symptoms include changes in sleep and appetite paired with lower energy levels, interest in activities and self-worth. People with depression feel sad or irritable most of the time. Depressive episodes can give way to periods of normal feelings before another depressive episode presents. Like bipolar, there are “ups and downs” with depression, but the “ups” are only ever as high as normal functioning. Next page: treating bipolar with migraines.